Captain Ginger #1 Review – AiPT! AHOY is injecting some very welcome life into the comic book market with books like Captain Ginger. Bringing the value back to comic books, AHOY is a new publisher on the block to keep an eye on. With Captain Ginger #1, readers will get the main Captain Ginger story by Stuart Moore and June Brigman, a backup called ‘The Intrepid Files’ that delves further into the world of sci-fi cats, ‘The Electric Sky Bear That Inspired Ben Franklin,’ another prose story from comics master Grant Morrison, another Shannon Wheeler cartoon called ‘Too Much Coffee Man,’ and finally a Q & A with artist June Brigman. All that for $3.99? Damn. 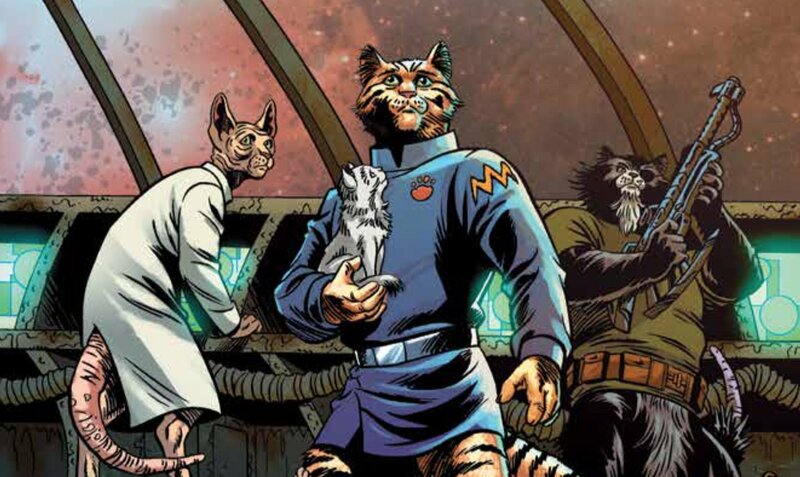 So who exactly is this furry space captain? Well, we join our traveller mid-disaster. The alien life forms known as the Lumen are attacking their ship, leaving Captain Ginger to be the captain he needs to be. Along with a cast of other cute feline crew members, the ship makes it out alive only for Ginger to lose his crew to a mutiny. It’s up to Ginger to get his crew back and continue the fight against the Lumen. This is a wild sci-fi tale with its own cute twist. There’s a strange nostalgic feel to this book. It harkens back to the pulp sci-fi books you would find in a family member’s cupboard or a charity store. It has that fun feel to it that leaves readers with a sense of peril, but also a huge grin from ear to ear as they breeze through the pages. Also, it should go without saying, but if you like cats, this is the book for you. With the ‘Intrepid Files’ backup also being about Captain Ginger, this is AHOY’s most character focused book yet. Even Shannon Wheeler’s cartoon is about cats. In that sense there is less variety than was seen with the likes of High Heaven and The Wrong Earth, but that’s not necessarily a bad thing. Morrison’s prose story is again a must-read for fans of his work. There was a time that prose Morrison was hard to find beyond an issue of Batman and his Heavy Metal editorials, but with AHOY, he’s giving readers something special. His Benjamin Franklin story is engaging and contains some classic Morrison wit. It’s hard to critique a comic book that is such a great value for money. The only real issue that could arise with this series is the lifespan of a character like Captain Ginger. At first glance it feels like the kind of silly story you would find in 2000AD or Heavy Metal. And while this chapter is entertaining enough, how long will readers put up with classic sci-fi mixed with cat jokes? It’s just far too early to tell at this stage, but perhaps if you are not a ‘cat person’ this book may have little new to offer. Should you read it? Short answer: yes. Longer answer: AHOY is injecting some very welcome life into the comic book market with books like Captain Ginger. Perhaps this story in particular is not to everyone’s tastes, but with the variety of content in each issue, it really is worth picking up a copy to see for yourself. Will a sci-fi cat story remain engaging long term?